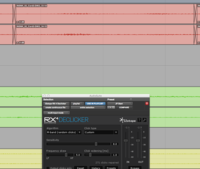 First, I would highlight a section of audio manually. 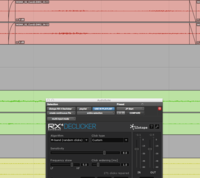 -Perform 5ms crossfades at the start and end points of the RX4 render. This is something I do dozens of times daily. To create the fades I use just the fades command of Beat Detective. It works well if I highlight over the start and end points of the render and choose "smooth" in the Edit Smoothing section, but I would love a way to do all this with one Batch Command click. It will do which ever one is up front. Use these BC's to call up the AS, then save the preset as user default or use this to open the preset. 2 "Open Audio Suite Preset"
Thanks, would you be willing to save a script/command for the first thing you mentioned that I can easily load into Batch Commander? I am already stuck on step 2. Forgive me, I'm still getting my head around how BC works. 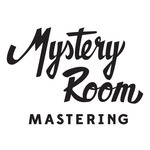 I've been a Pro Tools user for 10 years so I'm not new to computers, but the BC programming is tripping me up a bit. should be something like this. I don't have RX so i can't test. Thanks, I think I'm making some progress. 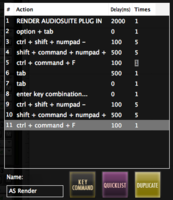 I don't need the BC to open the specific plugin in AudioSuite, or load a preset. I have my preset set to load with the plugin. Would you mind letting me know what that script would look like, or sending something I can load into BC? I think this is a better way. 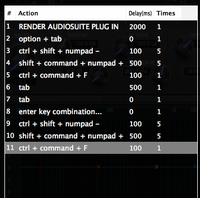 Make sure tab to transient is off (OPT CNTRL TAB) and set nudge value to 1ms. Thank you, I'll test this evening. Your help is appreciated. Batch Commander is a great tool but I think it's a little hard to understand if you don't have any computer programming experience, just my two cents there. Trying this workflow gets me close, but not quite what I was looking for. The rendered section does not crossfade with the un-rendered section. It also does a few other extra things at the end that I'm unsure of. The two red tracks at the top of the screen shot are the ones I processed for this test. I'll post a few screen shots. The first one is what happens. The second one is what I want it to look like, the third is the commands I entered based on your advice. "SHFT OPT - " 5 times with a 1ms nudge set. I would like crossfades as seen in the 2nd image. The top image only fades in and out the processed section and is what happens when using the last full steps you gave me. My goal is to crossfade the processed section with the unprocessed section both before and after it.